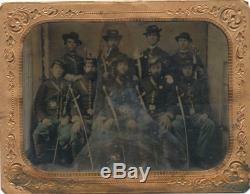 BIG 1/2 plate (51/5" x 4") tintype of nine armed Civil War Union cavalrymen. You can see that at one point there was some water damage over the area of the front center and second from the back left troopers, otherwise this would really be a screamer. Each cavalryman is holding his sword. There is a light approx. 1 bend from the right that runs through the stomach and to the sword of the soldier sitting in the front right, and a few small approx. 1 bends emanating from the top center under the mat and running downward. Comes with a mat, preserver, and cover glass. Please see my other auctions for several other Civil War photographs being listed. Please see pictures as they are part of the description. The item "Half plate civil war soldier tintype" is in sale since Saturday, July 04, 2015. This item is in the category "Collectibles\Militaria\Civil War (1861-65)\Original Period Items\Photographs". The seller is "gettysburg350" and is located in Winchester, Virginia. This item can be shipped to United States.